4 years servicing and warranty makes buying a Honda sweeter. Honda is giving customers the opportunity to create their very own exclusive offer package in the new ‘Your Honda, Your Way’ campaign. Buyers have a choice between a range of offers including four years complimentary servicing, an insurance contribution and extended guarantee to tailor-make a package to suit their requirements. Customers can pick and choose two or three of the above to make any combination they wish. To bring the campaign advertising to life, Honda has teamed up with Swizzels Matlow, the makers of Love Hearts and used the retro sweet imagery to emphasise the customer choice element of the ‘Your Honda, Your Way’ campaign and give the adverts a fun, fresh look and feel. 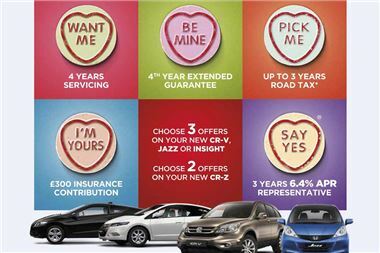 The Love Hearts images will be a familiar feature across all Honda Marketing activities throughout the first quarter of 2012. Visit www.honda.co.uk/newoffers for more information on the offers available and to find your local Honda dealer.